OK you American Idol watchers (and, I know who you are! )...what was up with Adam Lambert finding himself in the bottom two last night? What? Shocking, I tell you...shocking! This front-runner with the golden pipes should not have been in that position! 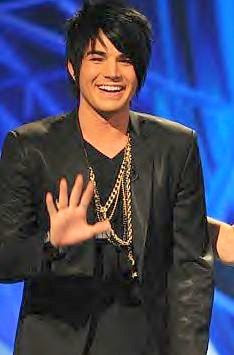 "Grandma's for Adam Lambert" unite...get those fingers ready to vote for our boy next Tuesday night! Talking about what this world is coming to...the Swine Flu epidemic has everyone in a tither...including me. Now they are warning people not to put themselves in harm's way by getting in enclosed spaces...or around a large group of people....In fact, we are being told to keep a distance of 6 feet from others. Now, let's see. Tomorrow morning I am getting on an airplane (enclosed place) and heading to the Kentucky Derby (gazillions of people)...Hmmmm...maybe I need to start to thinking about decorating a mask to match my Derby hat. Something cute with little horses on it? Talking about the Swine flu....Mom was telling me yesterday that she went to the bank and the mall on the van provided by "The Home". People are so skittish these days that she said someone on the van sneezed a couple of times...and everyone got very concerned and told asked him to 'stop sneezing' right now! That is like asking someone to stop hiccuping....can't be done just because you want it to. I do remember when I was in high school and people used to hold their nose to "stop" a sneeze. All that did was blow your ears out....or, in some cases...their brains! A gentleman (and I use that term very loosely) was on the view this morning touting his website. The women said that he was the first person to have been booed upon introduction. What was his website that caused this negative reaction? It is a place for married people to go to when they are seeking someone to have an affair with. You sign up and browse through thousands of profile of other married men/women looking to have affairs. He deserved the boos in my opinion. I am having phone problems with my brand new Panasonic phone system. In the middle of a call, I get a "beep, beep, beep" and become disconnected to the person that I am speaking with. So, I called the technical support number...and, after pushing numerous buttons on the phone, I was able to speak with a live human. He gave me some instructions to refresh the phones and off I went...relieved that there was a solution to my problem. The next day, the same issue occurred and I was cut off of two phone conversations. So, a follow up call was made. This time I was told to re-register all of my phone handsets and voila! all of my issues would be solved. In the middle of a conversation this morning..."beep, beep, beep"-- the call was ended without my knowing it. Another phone call was made to Panasonic....aaargh....and, I am now instructed to send back the phone system and they will send me a refurbished one. Refurbished? Let's see. I bought a brand new phone system less than three weeks ago and they want me to ship it back to them (I pay the shipping costs!) and in return I will get a refurbished phone system in a week to ten days. Am I crazy....or does that seem a little strange to you? I am thinking that I will just pack up the set, return it to Target and purchase a brand new set instead....and, get it all done in one day. I'll be back on Sunday filled with lots of stories....as well as lots of money from all of my winning horse race bets too, I hope. I went with some of the girlies to see "Dixie's Tupperware Party"
If you haven't heard about it, check out the site above and see if the tour is coming to your city...! Dixie is a bonafide Tupperware salesperson. "She" (and, I use this term loosely) actually sells Tupperware products during and after the show. She calls it "crap" (!) but through her hilarious comedy "she" shows us how much we absolutely need these items. We were laughing so hard our faces hurt! Sipping wine from a Tupperware cup, she is as bawdy as one can be without getting arrested. Her high energy can be exhausting at times...but, a great way to spend an evening. I highly recommend it! There are some things that occur in one's life that just make you say; "Why?" For example, I am checking the weather for Louisville, KY, several times a day daily since we are heading there Friday for the Derby. I read and reread the weekend forecast and even watch the latest video. Why? Do I really think that I have any control over Mother Nature? Will my constantly checking it out make the rainy and stormy forecast any better? Why am I making myself crazy? I recently heard a consumer alert hint on television. They were talking about what to do if your phone falls into water, or any other liquid. One of the things expressed was not to microwave your phone! Why would anyone even consider that??? A blow dryer maybe, but microwave? C'mon people....why? The neighborhood dogs have been barking nonstop around here. I am not talking about a little bark here and there...I am talking about hours....constant bark! bark! bark! for hours! Why? Can't they say what they have to say and then remain quiet for a while? Actually, I think that Dave may have asked me the very same question once (or twice). Lately, I find myself eating when I'm not even the slightest bit hungry. Why? For example, my sister introduced me to these incredibly totally addictive wonderful cocoa roast almonds. They are sold under the Emerald brand and are merely roasted almonds with a dusting of dark chocolate on them. To say that they are good would be an understatement. They come in this green container with a screw on top that I have now unscrewed a million times as I continue to reach for more of these morsels. I keep telling myself that almonds are good for you, dark chocolate has been found to be healthy...and, what about all of that exercise opening and closing the top of the container? While shopping the other day, the saleslady began to help me with some jeans that I was looking for. She convinced me to try on these ultra skinny-legged blue jeans and roll up the bottoms into a haphazardly-folded cuff. "This is the latest style!" she exclaimed, "Throw on a pair of flip flops and you are all set!" So, of course, I walked out of the store clutching the bag with my new fashion statement inside. Putting them on the next day to go to an art show, I did the cuffs just like she said...threw on a shirt....looked in the mirror and said, "WHY?". Why is this 60 yr. old woman dressed like a teenager?!?! Then there is the issue of looking up medical things on the computer. Most of it tells the extremes of certain medical issues and gives you a million symptoms that you suddenly begin to experience as you are reading. The anxiety that it brings about can be overwhelming at times. Why do I do this to myself?!? Maybe I should go look up "anxiety symptoms" online and see what it says! Per our annual tradition, Dave and I will be heading out to Louisville this Friday morning for the 135th Kentucky Derby "Run for the Roses"! The Ladies Race, The Oaks, is held on Friday...and, this is the race that we look forward to as Dave and his Lexington buddy purchase good seats for it. This is when the fillies strut their stuff...and, it is a lot of fun. Making it even more personal to me this year, they are dedicating the race to breast cancer survivors...encouraging everyone to wear pink...and, more importantly, they are donating $1 for each Oaks attendee...with a minimum donation of $100,000! Unfortunately, last year, it was torrentially raining and we weren't even able to enjoy our great seats....hopefully, this year will be better weather wise! I am crossing my fingers! Dave encouraged me to make a hat for the event this year....so, I did. I tried to make the four little horses around the hat base look like females...not an easy task. But, with a little help from my local Michael's craft store....lots of glitter, some colorful tassels, ribbon, flowers...and, lots of hot glue...here it is! Lazily luxuriating in bed this morning, I sensed something was different, very different. The house was quiet...very quiet. Just a few days ago there was the constant sound of babies and toddlers all around me. There was an energy in the air that meant family was around. There were toys, diapers and wipees everywhere. The cd's that were playing weren't rock music or golden oldies but instead were nursery rhymes or lullabies. Winnie the Pooh and Tigger were the tv shows of choice. Bottles were being cleaned, mouths were being fed, and controlled chaos was the order of the day. So, today, the house is straightened up...beds have been remade with fresh linens....borrowed baby items have been returned to their owners...all remnants of spilled foods have been cleaned up...the refrigerator has been cleared of mashed zucchini, bananas, and sweet potatoes...my assortment of baby things have been wrapped up and put back in the attic...until the next visit. I know that all grandmas say that...but, I couldn't resist! His vocabulary and grasp of concepts seems beyond his 2 1/2 yrs. Of course I am quite prejudiced...but, during this last visit, he really amazed me. Owen is also very kind and compassionate. While he and I were playing with a wiffle ball and bat, the ball accidentally hit me..."Are you okay, Grammie?" he immediately asked. Who couldn't be okay after that? I also purchased some beginner plastic roller skates for Owen...as well as knee pads, elbow pads, and a helmet. Ten month old Audrey is a wonderful mixture of sweetness and "devilishness" all mixed together. She has a great sense of adventure and loves to be on the go. Jenny was hoping to have a "prissy girly-girl"...but, I believe that she may have a little tomboy on her hands. She would rather explore her world than do almost anything else....including eating...! As soon as that bottle goes into her mouth, she pushes it away and lets you know that she wants to get down and start crawling around! However, with that being said, put some Cheerios or cut up veggies or fruits in front of her on the highchair and she does go to town ---grabbing the small pieces and shoveling them into her mouth as fast as she can! Like her cousin, Celia, she has the most gorgeous big, blue eyes! She studies her environment with great scrutiny including the faces all around her. When I held her in my arms facing me, she would stare at me intently...occasionally tapping on my nose or sticking those tiny fingers into my mouth. Audrey took such delight in play. Instead of just touching the sand in the large bucket outside....she was IN the bucket of sand outside....wiggling her toes all around and enjoying the experience! Celia is such a delight with those huge blue-grey eyes and that infectious smile! At seven months old she is just starting to explore the world of 'getting around'. She can sit up without a problem, but hasn't quite mastered the art of crawling yet....Her legs are so strong and I am betting that it won't be long for her to start scooting around! She and her cousin, Audrey (10 months) seemed to have their own form of communication when they were all here last weekend. They would study each other's faces and then suddenly one of them would let out a squeal or a grunt. They loved to explore each other's faces and Audrey, especially, liked to reach out and touch Celia to check her out, I guess! : ) So cute to watch. I had to laugh when Celia's mom (or dad) was feeding her some veggies or fruit. Within seconds she would be sporting a 'food goatee'. When I fed her there would be an immediate scooping up of what didn't stay in her mouth....but her parents just kind of let it 'hang' there. The bottom line was that Celia could care less....She would just look up at you and seem to be saying, "Just keep shoveling that good stuff in....!" My first emotion is to smile as I think about the beautiful memories of four days together...days filled with hugs, laughter, chaos, noise, food all over, play and lots of love! I know that I am so blessed with this incredibly loving family...and, to be able to put my arms around my three beautiful (and, did I mention, "brilliant"?!) grandchildren when we are together....wow! The kids are all heading back on their flights home right now....and a very tired Grammie is holding lots of beautiful memories in her heart. More to come....but, in the meantime, here is the whole group of us during an unusually quiet moment. All my kids arrive in just a few hours. Having ones children and grandchildren living far away certainly makes their visits events of untold proportions....especially for this Grammie! The whole gang will be flying in tomorrow....four from Minnesota and three from Maryland. My arms are ready for hugs....! He enjoys seeing his reflection when 'performing', thus the reason for his stooping down near the end and looking at himself in the glass. Owen got his Cracker Jacks! After learning to sing "Take Me Out To The Ballgame" over and over and over (!) again....Owen got to actually experience his first real ballgame! 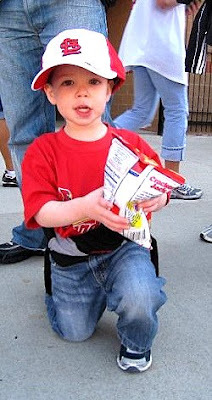 Last weekend, while the kids were visiting Mimi and Poppy in St. Louis, Owen went to cheer on the Cardinals. Best part? The Cracker Jacks?!?! 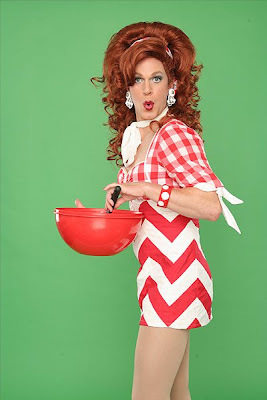 Just a reminder that my Jenny's Betty Crocker cooking video series continues tonight at 7 Eastern time....they are cooking up a yummy pasta dish!! Spring has certainly arrived as storms continue to rumble through the Birmingham area. Because the ground is so saturated from all of the rain that we have had lately, many trees toppled over from the high winds. My immediate neighborhood seems to have made it through unscathed this time...but, they are predicting more rough weather this evening. I went to see the musical "Wicked" last night. Between the elaborate costumes, the incredible scenery, the wonderful music, and the extremely talented cast...it was a great show. I loved the humor and all of the little clues and reminders that this was based on the story of "The Wizard of Oz". I also loved the life lessons that were taught throughout the performance...especially that the so called "Wicked Witch" really had a good heart. If you haven't seen it and it comes to your town....I highly recommend it. I am learning that I am certainly not the only grandma out there who is totally intrigued by American Idol cast member Adam Lambert. I have heard from several other grandma's since writing my article about being a "...giddy Grammie" over this talented singer. I am thinking that I should start a group called "Grandma's for Adam"! What do you think? If you could see me now I have a huge smile on my face. I also have a house filled with cribs, toys, diapers, formula, sippy cups, bibs, and baby food. FOUR more days and my two sons, their two wives, and three grandbabies will be arriving!!!!!!!!!!!! As many of my readers know, Dave takes over the cooking duties at times and creates some of the most amazing dinners...until last night. While I was at the show with my friend, he was busily putting together a dinner inspired by a recipe that he found. As we sat down to eat, he filled my plate with fresh asparagus (yum) and sauteed mushrooms (one of my favorites)...and, then a pattie resembling a hamburger (here's where the trouble began). "What is this?" I queried? "Taste it and see if you can figure it out," he answered. Well, it turns out that the recipe called for making a pattie by grounding up pork tenderloin and shrimp....(!!!) which was then cooked on the grill. And, then to top it off, it was accompanied by a peanut butter sauce made of various ingredients that I was really afraid to know! I felt badly because I know that he put a lot of time and effort into it...but it really was an interesting strange combination of flavors...."Well, sweetie, you can't win them all," I said as I wrapped the extra patties up for him to take home...and, began to pop some popcorn. Did I mention that my children/grandchildren were coming in Thursday???? As the last truck pulled out of my driveway, I waved good-bye and privately prayed hoped that this would be the end of my home repairs for a while!! Being a homeowner certainly has its pluses...but, when things begin to go wrong...it can really get expensive and stressful. My home was built around 1972. My 'wusband' and I were the second owners and fell in love with it at first sight. While it was just a typical brick split level home (the popular style at that time), it had a certain charm that drew us both in. Our previous home was quite a bit smaller...but, had some great features that really fit our lifestyle at the time. Not being able to afford much furniture during those lean years, the empty living room served as a wonderful playroom for my two energetic boys. We had a variety of toys in there for them to enjoy...including a little sliding board and a battery-powered car! Many games of catch were played there when the weather outside wasn't cooperating. We were quite proud of this first house of ours...and left there with some great memories. Buying our second home was quite an adventure. We had the typical nervousness of a young couple obligating themselves to a higher monthly house payment. Can we do this? Are we crazy? I still remember having a couple of friends helping us move in. We just borrowed someone's truck and made a whole lot of trips back and forth! It was exciting and nerve-wracking all at the same time! The previous owners of our new home loved gardening and the back yard was filled with a variety of shrubs, plants and flowers. I remember the gentleman telling us that he had worked the yard so that something would always be in bloom all year round. Lovely, really lovely. Unfortunately, we were garden novices when we moved in....and, we slowly, and inadvertantly, killed off many of his beautiful treasures. Through the years, plants were replaced as we learned more about upkeep and care. I remain in this same house 30+ years later and sometimes think; "If this house could only talk!...it would have a lot to say." Many changes have occurred through the years as my boys have grown and moved into homes of their own...my divorce...and, other life passages...as well as some wonderful celebrations and events held lovingly in this house of mine.....the annual Fourth of July parties, many bridal and baby showers, dinner clubs, friends over for game nights...birthday parties, etc. etc. etc. Giddy Grammie loves Adam Lambert! I didn't feel this way in the beginning. But, then he began to really grow on me as the weeks went by. His voice was unlike any other...and, he seemed humble and sweet. He took songs that I knew and (as Paula says...) "made them his own" with that "Adam touch". His range was incredible...at times belting out rock songs in a loud voice reaching all kinds of falsetto marks....or gently singing a ballad. I found myself looking forward to his turn on the show week after week. His latest song choice, "Mad World" was absolutely, incredibly beautiful. His voice had a soft sweetness to it that made me want to hear more and more. I played it over and over again from the online video...and, thought to myself that I would go out and buy a cd from this singer in an instant....and, I would wait in line to purchase tickets for a show that he was in. 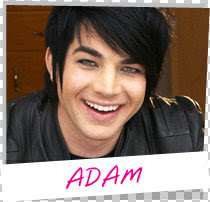 That's how much I adore this young, aspiring American Idol contestant, Adam Lambert. He makes me feel like a teenager again... and, I can't wait to see what he sings this coming Tuesday. The reality is that I am just another "giddy grammie" from his growing flock of admirers...most of whom are probably forty-five or so years younger than I am. First it was having the dentist tell me that I needed four crowns in my mouth replaced...cha ching! Then it was the plumber who tried to fix my leaking commode upstairs...cha ching! Then it was the very same plumber who had to replace my commode when he cracked it...cha ching! Then it was the plumber who told me that I needed to call the septic tank people about the washing machine water coming up through my downstairs commode...cha ching! Then it was the septic tank people who told me that I had a field line problem....cha ching! Then it was the field line specialists who tore up a large section of my backyard-including my sprinkler system....cha ching! Then it was the sprinkler system people who said that it was going to take two men all day long to redo my damaged sprinkler system....cha ching! The it was the yard man who found an outside faucet leaking water all around....cha ching! Then it was the electrician who came to check out some non-working outlets and found that my wiring outside needed to be dug up and replaced....cha ching! Where are those real money trees when one needs them? Adam Lambert sings "Mad World"
The recession is here....so, what are we to do? We are all in this together...so, we might as well share our woes with a celebration of sorts. So, who says that money doesn't grow on trees? I set the table with a "money tree" surrounded by chocolate gold coins, dollar bills and stock market reports. All of this was lying on a sheet of brown butcher block paper with paper towel placemats. In another room, the table was also adorned with a money tree...but, this one was surrounded by sales advertisements...these also made great placemats! One of my girlfriends really got into the "recession spirit" as she came to the dinner with paper clip earrings, a paper clip bracelet, a garbage bag belt...and, a brown bag pocketbook! This can of beans made a great vase for my flowers! For hors d'eurves I filled brown paper lunch bags with roasted peanuts in the shell and freshly made popcorn. I crinkled the tops of the bags to form a hand made bowl of sorts. Someone else brought wonderful home-made mini-pizzas and then, another couple 'splurged' on some cold shrimp and cocktail sauce. ....while one of my friends made (from scratch) this incredibly delicious and awesome looking 14 layer cake!!!!!!!!!!!!!!! Before the evening was over, I presented my guests with a real Georgia lottery ticket...in hopes that one of us might win the $34 million jackpot. We all made a deal to share the winnings if someone was lucky enough to win....but, it was not to be. Another part of the evening was spent watching the final four basketball games. I made sure that the guys were comfy in the room with the tv so that they wouldn't miss a shot...and Dave put together a basketball "pool" for everyone to be a part of. Each couple put in $10 and then filled in 12 squares on the boards...one board for each game. Numbers were drawn and placed along the perimeter of the board...and, at various times during the basketball games, winners were paid money for being on the right squares. Fun! Check out my mommy's newest project! This week, my daughter-in-law, Jenny, who works at General Mills, is launching a new site with an online cooking tutorial called: The Mixer. This exciting new site will be filled with informative, and entertaining how-to videos open to cooks of all abilities....and they are totally free! These complementary courses begin via webcast the week of April 6 and feature two energetic co-hosts; Lori Eaton and Katrina Szish. Week of April 6: Kickin' Chicken Marinating, brining and coating are easy techniques for preparing moist and flavorful chicken dishes. And, the featured dessert recipe is mouthwatering shortcakes. Week of April 13: Pastabilities Adventure beyond the typical spaghetti night and unlock secret flavors and ingredients to create delicious pasta sauces. Week of April 20: Greens With EnvyShore up your salad know-how and learn great salad recipes perfect for spring celebrations. Week of April 27: Viva the Tortilla Elevate taco night and opt for a festive alternative, such as burritos, wraps and a flavor-infused quesadilla. Week of May 4: Wok it Out Watch Eaton and Szish stir-fry their way through delicious recipes and versatile sauces. Learn techniques inspired by those used at Asian restaurants. Week of May 11: Small Bites. Big Flavors.From delicious appetizers like hummus and red pepper dip to dainty chocolate ganache brownies, see how pleasing these tidbit recipes can be. It just takes a minute to sign up...and, I think that it will be well worth your while! I can't wait for the first one this week! I'm so proud of you, Jenny! Oh no! Not my beloved Pistachio nuts!!! Last November I purchased a gigantic bag of Pistachio nuts at Sam's. By mid-December, every last one of these tasty nuts was eaten and enjoyed. In January of this year I baked a Pistachio pound cake. You know the kind-- where you take the basic yellow cake mix and add Pistachio pudding to it. Mmmm. By the end of the week Dave and I had finished every last bit of it. 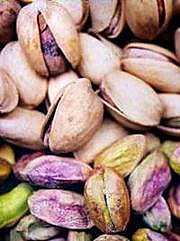 Fast forward to yesterday when I received a recorded phone message warning me not to eat any of the Pistachio nuts (or Pistachio nut products) that I had purchased from Sam's in November 2008--in that there was a nationwide recall-- because of possible health risks to consumers! (Sam's has a way of going through their sales info and weeding out specific purchases by their customers...thus my pistachio-loving name came up on their computer.) I was advised to bring in my bag of nuts and/or a receipt for a full refund. I did appreciate the warning....however, it was a little late, don't you think? I mean, would anyone still have a bag of nuts from November hanging around their house in April? First it was peanuts and peanut products....and, now this. What is a nut addict supposed to do? And, what is going on in the nut factories that is causing these Salmonella outbreaks? Where are the health inspectors when you need them? Who is regulating this industry? Aaack! OK. I have to admit that I am spending an inordinate amount of time on my computer these days! What is happening with our face to face communication now that these other sources are so readily available? Does this mean that all of the old rules will be changing to keep up with the times? Will the art of conversation just be an old relic from long ago? And, what about letter writing? I find that I hardly ever mail anything anymore as well. In fact, a few months ago, I bought a whole bunch of stamps...and, have hardly gone through a third of them. All of my bills are paid online. I keep my checkbook balanced online. I pay my taxes online. 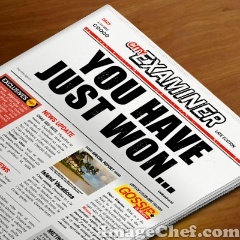 I read the news online. I check the weather online. I send birthday greetings via the Internet. My pottery business is online. I visit with my grandchildren online with Skype...etc. etc. Is mail as we know it becoming obsolete? I must say that I truly miss receiving a hand-written letter...that was such a big part of my growing up. Receiving something in the mail was an occasion...and, many of these letters were saved in a shoe box to be read again and again. I still have some of the letters that my (now) ex wrote to me when we were first married and he was drafted into the Army. Emails just can't compare to that. I will say that, even with all of today's technology, I still insist on sending a thank you note via snail mail. It just seems to be a more personal and authentic way to express appreciation. However, the upside to all of this is that I am connecting with more people now than was ever possible before. Facebook has reunited me with some old friends and allowed me to make some new ones along the way. Old high school buddies...family members that I had gotten out of touch with...and local friends that I don't get to see often enough...these connections have all been a result of my Facebook experience. I am even getting to know some of my blog readers on a different level through this site as we have all slowly found each other. 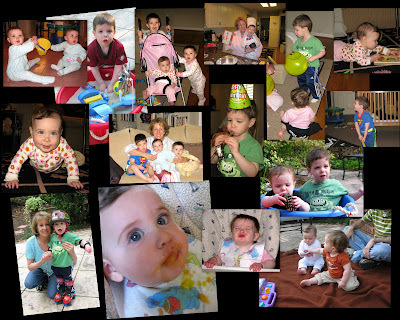 I find myself delighting in viewing online photos and videos of friend's families and sharing in their joy. It is all about instant gratification! We are becoming a population with expectations of getting everything quickly...to the point of losing our patience when we have to wait on something! Twitter is the newest group that I have joined. I haven't done many personal "tweets", as they are called...but, I have enjoyed reading the messages from a large group of people and organizations that I am "following" such as: Anderson Cooper, Tina Fey, David Gregory, American Idol (of course! ), Time magazine, Ellen Degeneres, the New York Times....and, Barack Obama! The rules of Twitter are that your message must be 140 characters or less. They figure that whatever one has to say can be said with this limitation. So, this popular site has allowed people all over the world to express what is on their mind or in the news...from the most mundane to the most important announcements. Basically, anything goes! You can find things out in real time by being on Twitter...sometimes before the rest of the world knows the info. Fascinating. With all of this being said, I guess that I have mixed feelings about our new modes of communication...but, I realize that this is the way of the future...so, I might as well join in. Just head to the nearest bank. 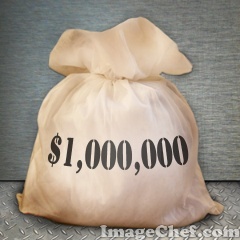 Tell them that you want the $1,000,000 that you just won. Oh, and don't forget to tell them "APRIL FOOL'S"!!!!!!!!!!!!!!!!!!!!!!!!!!!!!!!! !